Download a PDF of this report and share your thoughts on how these trends will impact your training organization in 2019. The organizations that will thrive in today’s rapidly changing business environment will be those that embrace change, adapt their business processes and practices, and prepare their employees to navigate the complexities of the market. The training function must be at the center of this evolution, with skilled learning professionals leading the way. Typically, the training function is charged with improving the skills and performance of others through the development of training programs. All too often, the skills of learning professionals take a back seat to serving the greater organization. Training and development professionals must take a hard look at their own skill set to gauge whether they are adequately prepared to support the business as it evolves. It’s time to focus on the knowledge, tools and skills that learning professionals need to effectively lead organizations through change. As the market evolves, so must the skill set of learning professionals. The key trends for 2019 reflect the challenge and opportunity to adapt the training function to the complexity of today’s business environment. As the market evolves, so must the skill set of learning professionals. The business environment in which organizations operate today is vastly different than a few decades ago. Learning is no longer viewed in the context of an isolated, one-time training event. Learning is now viewed as a continuous process throughout the employee lifecycle, without a definitive expiration date. As a function, we need to continue to move from an event-focused mindset toward system thinking, where we create the systems and environments for continuous on-the-job learning. We must challenge ourselves to look beyond the training event and view L&D as more of an ecosystem with experiences that we control. These experiences will be adopted by future generations of employees. What makes this type of program development unique and challenging is that the training function often doesn’t control many of the content elements included in these learning experiences. Also, the triggers for employee development often reside in systems and data repositories beyond the learning management system (LMS). This reality will demand that the learning professional become more aware of the systems across the organization that can contribute to the employees’ learning experience. There is a growing focus on the role that confidence plays in skills development. Low confidence is a barrier to proficiency. The implications of the confidence level of an employee on skills development has roots in education and is now crossing over into corporate training and development. Assessing confidence level to determine competency should be part of the evaluation of an employee’s performance and development. So, what should L&D do when an employee is exhibiting high competence but low confidence? Repetition and practice of learned skills has been shown to increase both knowledge retention and the likelihood the skills will become engrained behaviors. Creating experiences that allow employees to practice new skills in the context of their daily workflow will help build confidence and enhance performance. To assess learning, L&D must move beyond simply testing the transfer of knowledge. We should be focusing on whether the learner has the confidence to use that knowledge, too. Blended learning is traditionally the marrying of e-learning and instructor-led training to create a learning experience. As technology evolves and there are more options available to deliver training, a multimodal approach to learning starts to take precedent. The need for optimal balance among formal learning, social learning and experiential learning is more pressing than ever with countless tools at our disposal. We need to shift our focus away from merely a classic view of blended learning to instead focus on blending experiences for effective learning. We need to determine the optimal learning experience for an employee to build knowledge and apply the necessary skills to the job. Each job role will require a personalized combination of experiences to ensure success. This blend could include coaching, job shadowing, role-play, game-based learning, classroom training or e-learning, to name a few. Learning professionals must leverage the tools and resources available to build a robust experience for each employee. Jobs are going unfilled because of the lack of skilled talent. Whose responsibility is it to ready potential job applicants and new hires with the skills they need to succeed in the workplace? Is it the university? The organization? The individual? We are seeing an opportunity in the market to take on pre-boarding for companies. Think of it as a “train-to-hire” approach to recruiting in which applicants are placed in a job once they are fully trained. Technical, health and safety industries are already doing pre-boarding. The LTG acquisition of PeopleFluent to expand its offerings to include talent management is an example of the market’s tightening relationship between L&D and talent management. For pre-boarding to be successful, organizations would first identify the competencies and skills needed for every job role. They would then partner with a vendor that supplies the specific training they need to upskill potential employees. This training will enable new hires to hit the ground running and increase their time to proficiency once on the job. Time and again, we are seeing the training function under increasing pressure and scrutiny to mitigate company risk. Business risk comes in many forms – a data breach, theft of intellectual property, employee injuries or allegations that could impact the public perception of the company brand, etc. This year, Starbucks made headlines following the arrest of two black men who were waiting at a café for a friend. Facing pressure to quickly right a wrong, Starbucks closed nearly 8,000 stores early one afternoon to conduct an anti-bias training with employees. If this scandal taught L&D anything, it’s that the training function needs to be proactive and strategic instead of reactive. Starbucks’ knee-jerk reaction to quickly develop and deploy training at this late hour illustrates a Band-Aid approach to a crisis. If we’re in crisis prevention mode, it’s too late. We need to be ahead of the scandal. If we fail to plan, we are only further damaging the perception of the training function. When you think about it, the training team is essentially on an island tasked with performance support and employee development for the entire company. But what about the learning needs of instructional designers? Training program developers? Training managers? The employees inside the training function need career development opportunities to grow their skills and lead the change at their respective organizations. We need transformation inside the training function. L&D must build investment and time into its budget to upskill the training team that’s leading the evolution. This investment may require L&D to look outside of its own available resources to find the support that it will need. 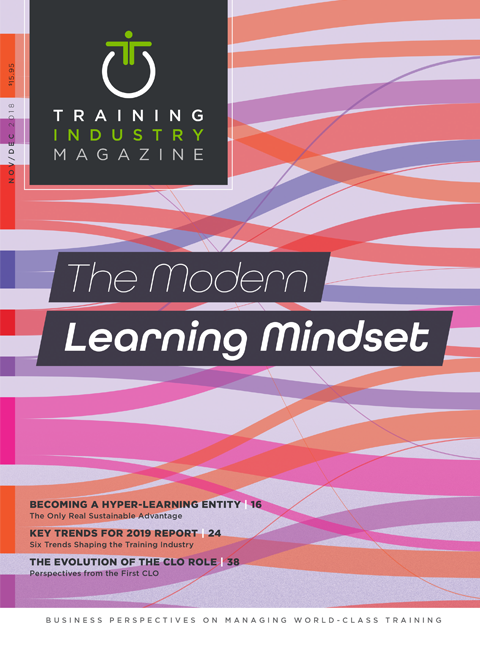 We must prioritize the learning needs of training professionals to prepare them to navigate the challenges of today’s business environment to deliver world-class training. Doug Harward is CEO of Training Industry, Inc. Ken Taylor is the president and editor in chief of Training Industry, Inc. Michelle Eggleston Schwartz is the editorial director for Training Industry, Inc.